Do you know that well serviced appliances last longer and consume less energy? And that’s exactly what we do at Appliance Repair Castaic CA. We service your appliances to keep them energy efficient and functional, but also safe. Our company’s legacy goes back in years just like the community of Castaic goes back in decades. Everyone in our company is focused on each customer’s needs but is also updated in order to service well every new age appliance. What do home appliances need? Want to know why our appliance repair service matters? In order to function well, home appliances must be installed per manufacturer specs. But dryer installation will also involve connecting the vents and keeping distance from the walls for greater efficiency and safety. Gas appliances require equal attention because faulty connections might lead to gas emissions. And although fitting well every new appliance is crucial, their service is also critical. If gas oven repair needs are not covered fast, clients will suffer the consequences which often relate to their safety. Clogged dryers also make homes unsafe. Damaged fridges consume energy and endanger people’s health. And leaking appliances can cause serious property damage. By offering routine appliance service, we prevent such nightmares. And rest assured that our techs are skilled to service any household appliance and deal with gas problems. Every single one of our appliance service technicians is certified, qualified, and well trained. We have long experience in services and are dedicated to our job. When you need our help fast, you can count on our quick arrival. We are never late and always well equipped to replace components, fix, level, troubleshoot, and inspect your appliances. Our Castaic Appliance Repair in California can fix any type of gas and electric appliance. 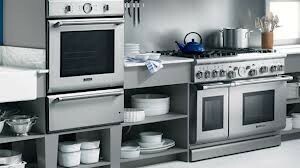 We service small or regular kitchen appliances, ranging from dishwashers and ovens to microwaves, fridges & freezers. But we are also experts in washer & dryer services. Whether you want to fix your dryer or install a new oven, rely on the high quality of our work, friendly rates, and professional stance of each tech at our Appliance Repair in Castaic CA.